And we also adjusted the layout of OGC setting page to make it more intuitive. More important, the waypoints can be exported as GEO and SHP formats, so they can overlay to existing project files directly or can be applied to spatial analysis and map displaying. Except these new features, recently we are also keen to support diverse high precision surveying devices, which would significantly enhance the accuracy of field surveying. 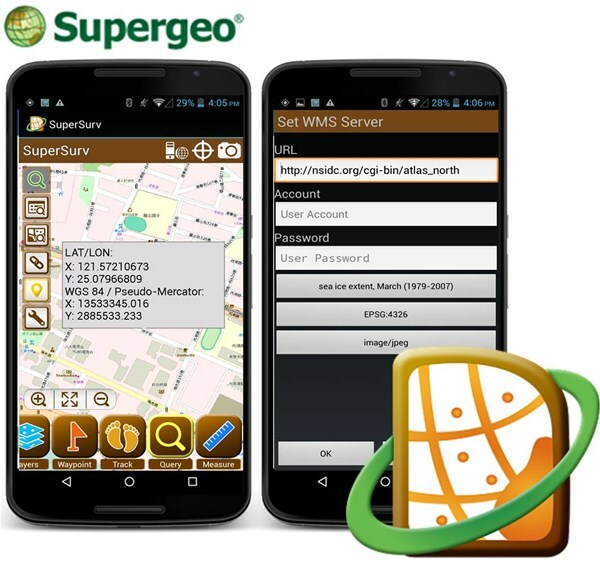 Specially designed for field workers to collect spatial data, SuperSurv is mobile GIS software available on two major operating systems of mobile devices: iOS and Android. By integrating GIS and GPS technologies, it provides various capabilities for the users, including spatial data creation, querying, and measurement. Furthermore, SuperSurv supports both online and offline basemap settings to adapt different surveying environments. Also, SuperSurv works well with other SuperGIS products, such as SuperGIS Desktop for data editing and SuperGIS Server for data sharing. Finally, its user-friendly interface and easy-to-use workflow allow every SuperSurv users to collect spatial data and accomplish field tasks with ease. Supergeo provides the trial of SuperSurv on App Store and Google Play. So why don’t you download and experience its powerful GIS and surveying capabilities for free?